Before my recent trip, I hadn't been to Palm Springs in over 20 years. Now, I wonder what took me so long to return. It's a wonderful vacation destination for short stays of four nights or for longer stays of a week. Palm Springs is desert beauty  pure and simple. The soaring, rocky mountains, barren as they are, remind me of certain Greek islands in the Aegean but without the surrounding sea. In the canyon sits Palm Springs with its charming main street, Palm Canyon Drive, filled with boutiques. Check out the cute shop Pawz for wonderful dog items, for your own pets or for gifts. There's also a lovely hidden courtyard in back of the shop where you will find people sitting, reading, and sipping coffee, with beautiful gardens and a view of the mountains. Further along the street, a number of restaurants offer outdoor dining. Palm Springs is known for golfing so if you like golf, this is paradise. I'm not a golfer but I love hiking and walking. For an unforgettable outdoor experience, take the Palm Springs Aerial Tramway (pictured above) for the 10-minute ride up to Mount San Jacinto State Park. There is a large, almost magical alpine forest up top, with trees, rambling creeks, and even snow! Tip: Bring a jacket or sweater  it's 30 degrees cooler up there! There are dozens of trails and hiking them (for one hour, a half day, or all day) is extremely relaxing and puts one close to nature. The views of Palm Springs and the surrounding mountains are breathtaking. The San Jacinto forest is one of the most unique experiences in the U.S., I feel. Another must-see is Sunnylands , the former Annenberg estate. The grounds and home are beautiful, with mid-century modern architecture by A. Quincy Jones and sweeping views of the San Jacinto and Santa Rosa Mountains. You need to reserve a timed ticket in advance for the unique tour; only seven people go at a time. The Annenbergs hosted seven U.S. presidents and numerous other foreign leaders at Sunnylands from 1966 to 2009, and today the estate is still used for retreats by governmental officials and visiting dignitaries. Having a car isn't required for Palm Springs but it helps if you want to explore the neighborhoods. I skipped having one and was fine, but this also depends on your hotel location. 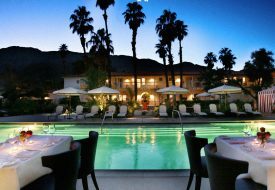 In terms of where to stay in Palm Springs, my favorite is the Colony Palms, hands down. It's the perfect blend of Mediterranean and casual old Hollywood (1930s), with a dash of Moroccan decor. The hotel is a boutique property with 56 rooms that are adequate in size and very comfortable. I recommend a room on the second floor with mountain and pool views, if you can get it. Around the property are several cabanas, alcoves, and rocking chairs on a porch, all designed to foster an easygoing, relaxed vibe. It's the hotel's pool area that's a big winner. There is a lovely pool, with a bar and restaurant in front, surrounded by palm trees, and then the gorgeous mountains in backdrop. It couldn't be better on a Hollywood set. Mornings and sunset are stunning. The restaurant food is excellent and dining outdoors pool-side is a must. Service is good but don't be rushed like you might be used to doing in the city. Relax. As for other hotels, the Parker is known as a smart splurge (and I do recommend the Parker's spa  unique and worth making an appointment), but I find the hotel overall to be impersonal. Also, its pool areas (one for adults only plus a separate kiddie pool) are just OK. One other key downside is that the Parker is not close to the center of town. But if you love mid-century modern decor, the Parker is a good choice. Back at the Colony Palms, which is just two blocks from downtown, the hotel has an intimate, very relaxing ambiance. And the staff gets to know you. Everyone is tremendously helpful. It's easy to stay a week here and it's popular with L.A. long weekenders. As for when to go, perhaps the only season to avoid is summer. The desert will be hot! Like Las Vegas in summer, daytime activities are difficult (although the sultry evenings are nice). Spring and fall are ideal. Finally, Palm Springs offers easy access to Joshua Tree National Park (about an hour away). Im told there's also gambling in town, but I didn't check it out. Just one more reason to visit beyond the beauty and relaxation of the place! For general trip-planning information, see our Palm Springs destination guide.